Youngest son of Judah by the daughter of the Canaanite Shuah; born in Chezib in the shephelah of Judah. His extreme youth at the time of the death of his brother Onan was the ostensible excuse alleged by his father for the refusal to permit him to marry his sister-in-law Tamar (Gen. xxxviii. 5-12). Shelah became the ancestor of many families (I Chron. iv. 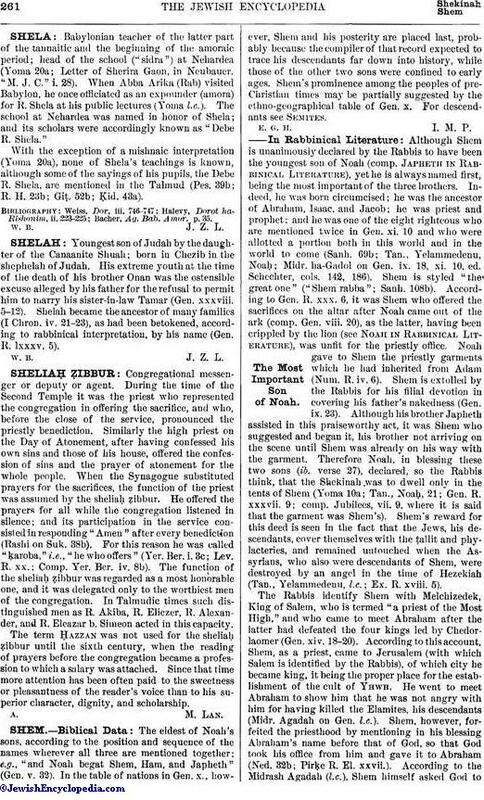 21-23), as had been betokened, according to rabbinical interpretation, by his name (Gen. R. lxxxv. 5).